For most of the summer, it has felt like California has been burning. Six firefighters and one fire equipment mechanic have lost their lives. Thousands of homes and buildings have been destroyed. The Mendocino Complex Fire – the largest in the state’s history – already has charred nearly 500,000 acres … and it’s not out yet. Altogether, more than 1 million acres have burned from one end of the state to the other. With the wildfire season as bad as it’s ever been in California, it should come as no surprise that the ground-based vehicles used to fight them have been stressed under the most extreme conditions. All of which puts a premium on the annual inspections performed by the experts at Golden State Fire Apparatus. Identifying and fixing small problems before they grow into larger – and more expensive – ones enables firefighters to count on their equipment when they need it most. The importance of preventative maintenance was illustrated by one recent case. A truck was brought in after battling a wildland fire. Its owners complained of a noise in the 1,500-gpm pump transmission. 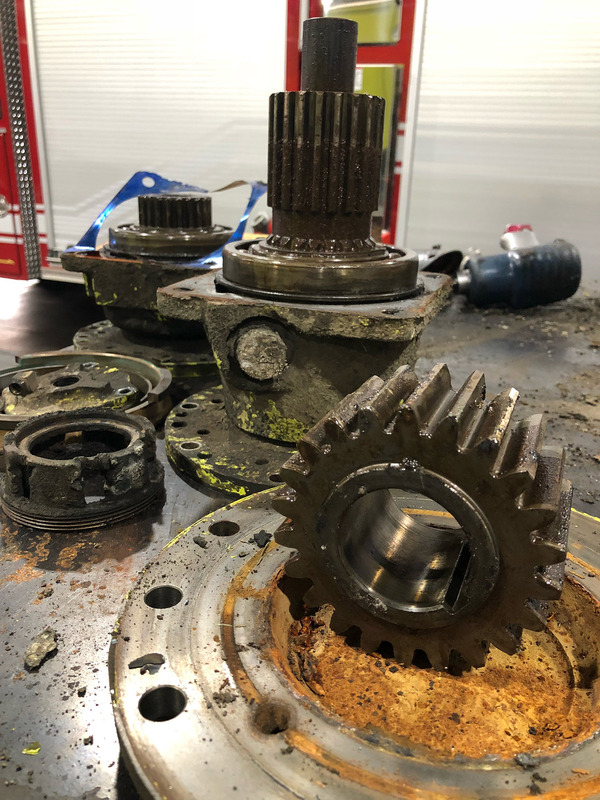 Instead, in what Tracy described as a “catastrophic failure,” his technicians discovered the slinger ring was gone – something the owners themselves could have seen had they followed standard maintenance recommendations. The contaminated oil also should have been a tipoff, Tracy said. The difference in not spotting the problem in the field and bringing the vehicle in sooner? At least $10,000 in additional costs to bring the truck and its pump back into service. This is an extreme case, Tracy said, but one that should provide a cautionary example to other users whose vehicles have been put to the test this summer. Fall and winter are prime time for regular maintenance inspections and servicing, especially for vehicles involved in battling summer blazes. A full inspection can take anywhere from eight to 20 hours, Tracy explained. GSFA has a service crew of nine in its 35,000-square-foot facility in Sacramento. At any time, as many as 20 pieces of apparatus are in the shop – which is why scheduling an appointment is critical. Depending on what the inspection reveals, it could take two to three weeks before the truck is operational again. Most trucks, if regularly inspected and maintained, will last 10 to 20 years. Given their cost and importance to public safety, taking care of that investment is the right thing to do. There is another financial reason that also is important. The Insurance Service Office (ISO) compiles ratings for cities and counties. Performing and documenting not just annual checkups but regular maintenance on fire vehicles helps to keep insurance rates down.